Canadian Association of Genetic Counsellors? The Canadian Association of Genetic Counsellors was formed in 1987 with the goal of promoting high standards of practice, facilitating and supporting professional growth and increasing public awareness of the genetic counselling profession in Canada. 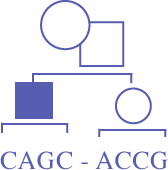 The CAGC administers the Canadian Certification examination for Genetic Counsellors and provides continuing education opportunities for its members. Who can join the CAGC? Membership is open to all genetic counsellors, genetic counselling students, and allied health care professionals working in the field of genetics. Clinical and laboratory geneticists may also become members. Student members are welcome! The CAGC provides core competencies and governs the certification process. The certification examination is offered every two years. What benefits does a membership offer? Access to the CAGC electronic mailing list, which is an excellent forum for sharing information and networking. What information is available on our website?